Though Jarvis has built a reputation as an innovative textile artist, she has also created thought-provoking mixed media and site-specific installations, such as the repurposed telephone poles of Urban Forest (2005), part of the You Are Here exhibit mounted to mark London’s 150th anniversary, and Nine to Five (2004), a functioning sundial at the historic London home Eldon House. A decisive moment in Jarvis’ artistic development occurred in 1990, when she realized that, by employing the embroidery technique of couching (laying down lines of thread that are then secured with fine stitches), she could recreate handwriting. 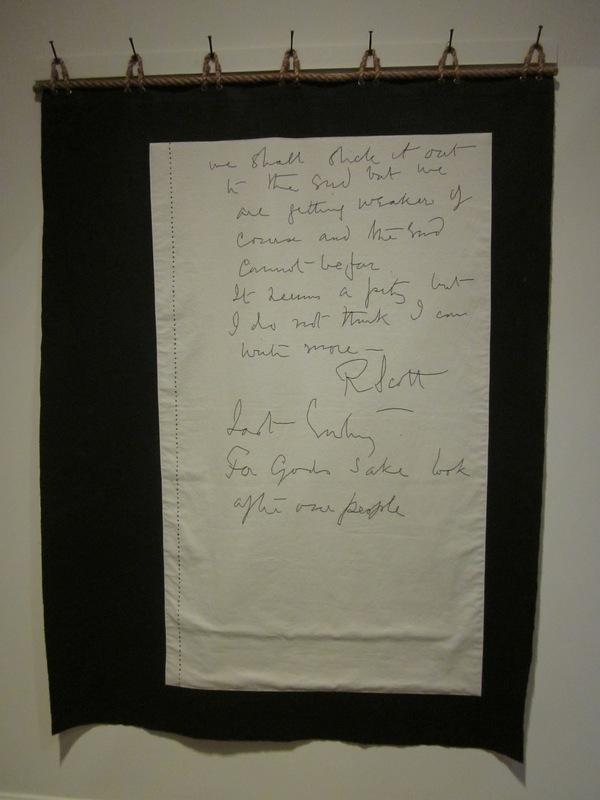 She embarked on the embroidered piece Success For Every Student (1990), which “rewrote” the motto of the London Board of Education as copied by 150 students. Captain Scott: Last Words (1991) also uses couching to recreate handwriting—in this case, the final text of the man who led an ill-fated expedition to the South Pole on January 17, 1912.1 Scott not only wrote his text confronting his own death and the likely death of all his men—but also addressing the news that another party had beaten them to the South Pole several weeks earlier. Narrowly missing the honour of being a history-maker, Scott here is commemorated in a medium that is intrinsically personal and ironically domestic. While it deepens the tragedy of the failed mission, it also asserts the right of smaller-scale narratives to be recognized in a public forum.